Real-photo postcard to cheer up soldiers. 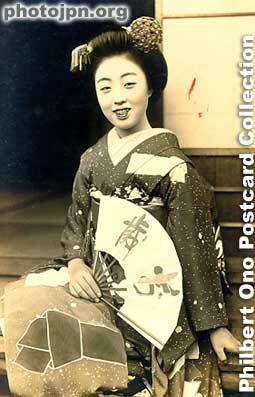 This card was sent as military mail from Kyoto on New Year's Day 1939. The kanji characters on the fan says "Banzai," the traditional Japanese cheer for victory and happy occasions. It also means "long life," something that soldiers would like. i think your postcards are brilliant, im learning japanese at the moment and think ther great . keep up the good work! !